Of all zoonotic diseases, rabies is the most feared and most misunderstood. Rabies is an acute and deadly disease caused by a viral infection of the central nervous system. The rabies virus is most often spread by a bite and saliva from an infected mammal. Although there is an extremely low incidence of contracting rabies in the U.S., the virus still causes great panic. The primary carriers of rabies are wild animals, although any unvaccinated mammal can be a vector for rabies. The CDC reports that wild animals accounted for 92% of reported cases of rabies in the U.S. in 2013 (Dyer et al., 2014). Raccoons accounted for 32.4% of the cases, followed by bats (27.2%), skunks (24.7%), foxes (5.9%), and other wild animals (Dyer et al., 2014). In the last 100 years, the number of human deaths from rabies in the U.S. has fallen from 100 or more per year to an average of one or two (CDC, “Rabies in the U.S.,” accessed 2014). In most fatal cases, death occurs largely because the victim failed to recognize the health risks associated with bite wounds and did not seek medical advice or treatment. No person in the U.S. has died of rabies acquired from a cat since 1975. This last incident occurred in Minnesota, when a 60-year-old man was bitten on the finger and died approximately seven weeks later (Human Rabies in the U.S., 2013). Several programs have been responsible for the decline in rabies cases. First, vaccination programs for dogs and cats began in the 1940s, virtually eliminating the chance of contracting the disease from our beloved companion animals. Secondly, an oral rabies vaccination program for wildlife was introduced in the 2000s (Wildlife Services, 2011). Thirdly, effective pre-exposure and post-exposure rabies vaccines have not only reduced the risk of infection for those who receive the pre-exposure vaccine, but they also reduce the effects of the illness and prevent death in those who receive post-exposure treatment. Some countries in Asia, Africa, and Latin America have a high incidence of rabies infection. These countries have large populations of domestic and feral dogs who live in cities and come in close contact with humans. These countries do not have the resources to provide spay/neuter and TNR programs; therefore, dogs remain the major vector species for rabies in these countries. While there are far fewer cases of rabies infection in the U.S. than in many other countries, the virus is still widespread among wildlife here and it remains a serious public health concern. The first symptoms of rabies in humans are similar to a flu-like illness, which includes fever, headache, and general discomfort. However, within days, the infected person will experience symptoms such as anxiety, confusion, agitation, abnormal behavior, delirium, and hallucinations. Once the latter symptoms appear, the disease is almost always fatal. Therefore, any person who has been bitten or scratched by a potentially rabid animal should see a physician immediately for post-exposure treatment. When a cat does get rabies, she usually contracts the “furious” type. Rabid cats stop eating, become very aggressive, and make unprovoked attacks on other animals and humans; they usually die within 4 to 6 days. Obvious signs of rabies infection in a cat includes, foaming at the mouth, trouble walking, lethargy, and erratic and extremely aggressive behavior. Unfortunately, if such symptoms are present, the only option is to euthanize the cat to prevent suffering and transmission of the virus. Any unvaccinated cat who bites a human should be quarantined for at least 14 days, examined by a veterinarian, and then vaccinated prior to release. If a cat appears ill at the time of the bite or becomes ill during the quarantine period, a veterinarian should evaluate the cat for signs of rabies and continue to monitor the cat’s health closely. To prevent the transmission of rabies, never approach or attempt to handle an unfamiliar cat (or wildlife). Always use a humane trap and wear thick gloves when handling or transporting a cat whose vaccination history is unknown. It is highly recommended that anyone handling feral or stray cats (or other animals, especially wildlife) should receive the pre-exposure rabies vaccine. It is also important to make sure all domestic cats (and dogs) receive the rabies vaccine, and TNR programs are implemented for community cats. In TNR programs, feral cats receive a three-year rabies vaccine, which studies have shown to be effective for longer than three years. Vaccinated cats provide a buffer zone between wildlife and humans, and vaccinating community cats will reduce the risk of an individual coming in contact with an unvaccinated cat. If a cat bites you, immediately wash the wound with hot soapy water for several minutes and clean with peroxide. Apply an antibiotic cream and cover the wound with gauze and tape. Monitor for infection (redness, swelling, pus) and seek medical attention if the wound doesn’t seem to be healing. If a cat (or other animal) is showing signs of rabies infection, the animal should not be approached and the appropriate authorities should be alerted immediately. The main response to rabies control in the U.S. in the past has been to try to reduce the vector species by killing groups of those animals. This effort has proven totally ineffective, hastening the spread of the disease by removing healthy animals, and thus creating territorial “vacuums” for other animals of those species to enter. The mid-Atlantic epidemic was actually caused by hunters bringing infected raccoons into the region from Florida. In Western Europe, the very successful oral vaccine VRG (vaccinia-rabies glycoprotein), developed in the U.S., has proven to be an effective, economical, and humane control for rabies. Wildlife vaccination via food bait has blocked the spread of the disease and prevented small outbreaks from becoming major epidemics by maintaining healthy populations of key vector species as immune barriers (Browne, 1994). A new oral vaccine, ONRAB (AdRG1.3 or human adenovirus-rabies virus glycoprotein), has shown promise in Canadian studies and is being investigated in the U.S. in Ohio, Vermont, New York, New Hampshire, and West Virginia. ONRAB is different in that it cannot induce rabies in humans or domestic animals who come into contact with it (Canadian Centre, 2012). Early trials have shown ONRAB to be significantly more effective than VRG in vaccinating raccoon populations (Fehliner-Gardiner et al., 2012). This is particularly important, as raccoons are the primary carriers of rabies in the U.S. and a threat to pass the virus to community cats. 1. Implement widespread oral-vaccine immunization barriers for key wildlife vector species, primarily raccoons and skunks. 3. 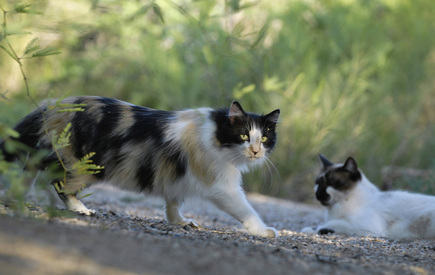 Recognize and support the vaccination and nonlethal management of feral cat colonies as an effective and important part of a comprehensive control program. The most effective means of stabilizing and reducing populations, controlling rabies, and protecting human health is to sterilize and return healthy vaccinated cats back to their supervised colonies. This helps to reduce roaming for mates, searching for food, and fighting; reducing these behaviors also reduces the transmission of other diseases. As mentioned previously, vaccinated colonies also create a buffer zone between humans and wildlife. Centers for Disease Control and Prevention. “Rabies in the U.S.” CDC.gov. N.p., n.d. Web. 16 July 2014. Dyer, Jessie, Pamela Yager, Lillian Orciari, et al. “Rabies Surveillance in the United States during 2013.” Journal of the American Veterinary Medical Association (JAVMA). 245.10 (2014): 1111-23. Web. 18 March 2015. Services, June 14, 2013. Web. 5 Mar. 2015. Wildlife Services. Oral Rabies Vaccination Program in the East. U.S. Department of Agriculture Animal and Plant Health Inspection Service, 2011. Web. 29 Sept. 2014.